Commonly known as the Oscars of the beauty industry, The Cosmetic Executive Women (UK) Beauty Awards recently took place. CEW partnered up with Latest In Beauty to create the CEW UK 2013 Beauty Awards Finalists' Discovery Box (£9.95 plus £3.95 P&P) to give beauty lovers the opportunity to try out the finalists' products. 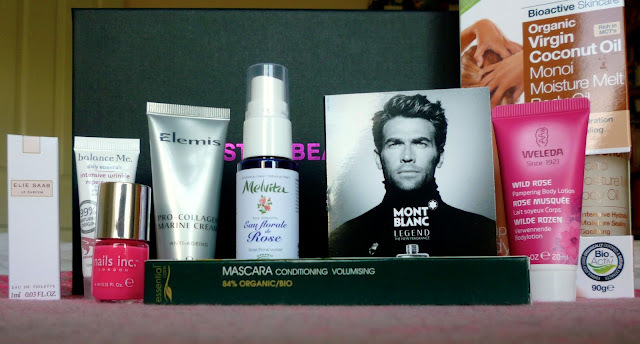 My box arrived at the start of last week and I'm so pleased to see so many natural beauty brands as finalists! Great to see a natural brand acknowledged here! Wrinkles aren't something I need to address just yet so I'll be passing this on to a family member to try. Another natural brand here, very excited to try this out! Again, anti-ageing isn't something I'm too bothered with at the moment so I'll be passing this on to someone else too. I'm not much of a fragrance wearer to be honest but I'll give it a sniff! Floral water has been getting a lot of praise recently, and this rose one is suited for sensitive skin so this should be perfect for me. I've been after a new natural body lotion to try so this is great! Did anyone else get this discovery box? Hey! I just found your blog from bbunch blog! Really interested in natural products so glad to have bumped into you! Will you give us follow up reviews? I'm especially looking to know how the mascara fares! I love weleda body cream and the dr organic products are really good too. Especially when you consider how budget friendly they are. I do use a lot of natural skin care, but I have never really considered a natural mascara. I would be really interested to know if it's any good.